In the first session of creating a lively Art club, we were together searching for the golden egg: here is the whole story. The second session was about discovering what is in the golden egg. If every artist is a world in itself (or a golden egg), describing oneself with a pallet made of “art forms” to create a self-portrait with words. In this third session, we connected the dots between the golden egg and the stars. Each of us is alone in its world but we are all connected by communication, inspiration & love and also by how the world was created. The oldest world creation myth was described between 1800 and 800 BC in sacred Indian text called Brahmanda derived from the two words- “Brahm” meaning “cosmos” or “expanding” and “anda” meaning “egg”. The cosmological theories of Hinduism describe an “egg-shaped cosmos”. The “cosmic egg” is later found in all culture creation myths and described by the alchemists as “the philosopher stone”. First, there was only water. But water wanted to create something, so it meditated and create warmth. From this warmth came an egg: a golden egg and in this egg there was a man: Prajapati. Prajapati stayed one year in the egg until he broke it. But the world was empty: so he stayed in the shell navigating one more year. Prajapati made his first sounds creating the earth, the sky, and the air. He then pronounced his first words and each syllable created the seasons. Prajapati started singing and praying. From his mouth came the Devas, divinities creating light in the sky and the Asuras, demons creating darkness on earth. Prajapati entered a deep meditation creating 5 children: the sun, the fire, the moon, the wind and the daw. He asked them to meditate as well. The daw, who was so pure, transformed itself in a beautiful nymph while the others conceived such a desire for their sister that a seed escaped from their bodies and Prajapati collected it in a golden receptacle. It became “Purusha”, the cosmic man, a terrible divinity with 1000 eyes and heads and 1000 arms and feet. Purusha was sacrificed by the other divinities; creating all the animals and humans but also melody, poetry, and customs. The Indian cosmology doesn’t count only one egg in the world. 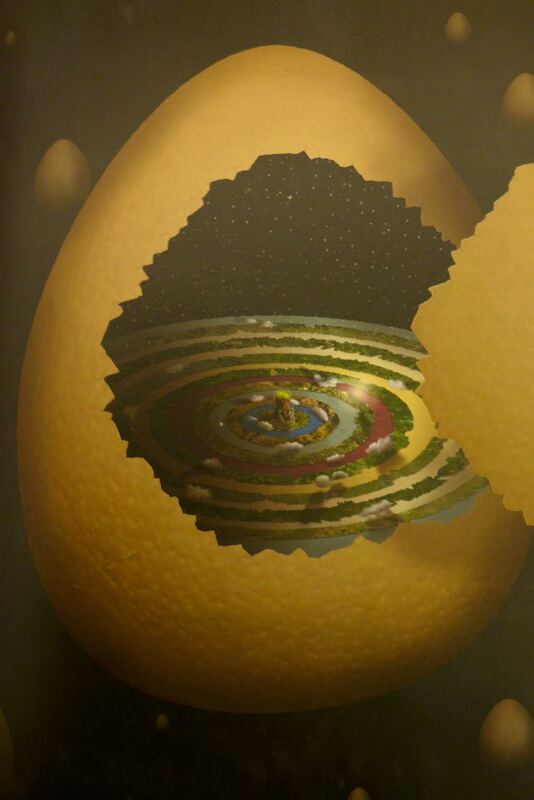 This egg possibly multiplied itself in 224 others or even an infinite number of egg creating a real golden milky way. Well, our art club counts 77 artists all keen to have their golden egg launched in space. Visual Designer, Dennis Luijer created a special space for all artists. As if “le petit prince” whispered him “Dessines-Moi une constellation!”. Dennis imagined a space for each artist that would be connected to the others in a constellation. On his 3 meters long poster, every artist appears in his bubble. Time to individualize each planet in a cutting work. Some are exclaiming “we already have a constellation!” while others take the scissors. And now: how to create a new constellation? By style? By affinities? All planets are assembled according to discipline.Our friend and space curator Jannus, found it a bit boring. A chaos seems more appropriate and creative. We all agreed that the first random constellation figuring on the poster was the one we wanted (for now). …and a nice common project full of light like the dawn: Aurore. Next Session 4: Developing a cohesive group.